Options: Over 5 lbs. Under 5 lbs. Contains the Infest Stop™* ingredient to kill fleas, flea eggs, flea larvae, and deer ticks for up to 1 month. Kills and repels mosquitoes that may transmit heartworm disease. The Smart Shield® Applicator is specially designed to make applying flea and tick control easier. Contains a coat conditioner. 1. Use finger scoop to lift open pink door. 2. Place tube WHITE SIDE UP under the pink tabs. 3. Close the pink door and the tube will snap open. 4. The cat/kitten should be standing for easy application. To apply, use tip to part hair and get next to cat’s/kitten’s skin at the base of the skull. Press square on pink door and squeeze out the entire contents of the tube onto the cat’s/kitten’s skin. 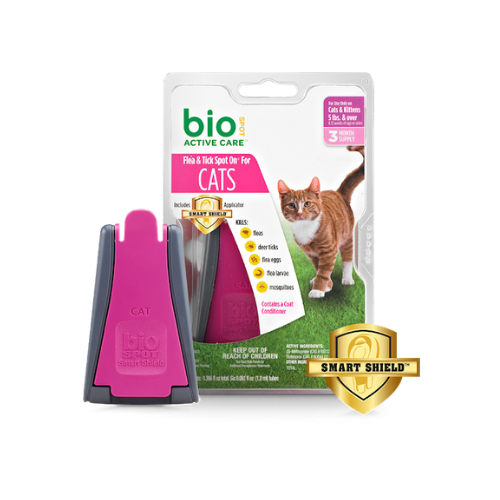 Do not spread Bio Spot Active Care™ Flea & Tick Spot On® for Cats by hand over the cat/kitten. Do not bathe the cat/kitten within the first 24 hours after Spot On® has been applied. Households with more than one cat/kitten should prevent cats/kittens from grooming each other until solution has dried. Although the cat’s/kitten’s skin and hair oils will over time distribute the application over the entire cat/kitten, brushing the cat/kitten 12-24 hours after treatment will help to distribute the material over the skin. 5. To dispose of empty tube, open pink door and drop empty tube into trash or offer for recycling if available. Close applicator device door and store in original package. 6. Do not reapply product for 30 days. Do not treat more than once per month.